In the fall of 2001, I was a stay-at-home-mom to 4 children ages 6, 4, 3 and 6 months old. As a former kindergarten teacher, I had tons of books and loved to read to my children. Most of my day was spent changing diapers, cooking, cleaning, and chasing children. I rarely found time to myself, but we had just gotten the Internet and I was anxious to dial-up and surf the net. One evening, the stars were aligned and all my kiddos were sleeping! Ahhhhh! I started writing short stories and poetry for my kids. I found chat rooms (when that was the BIG thing) for writers. I watched and learned. I noticed a poetry contest one group was having for October. They wanted scary poems. The winner could have a web page for a whole month. I wrote something about blood and screams and terror…it was about having a tooth pulled without pain meds. I won! I learned that day to keep people guessing and write the unexpected. The next day, high on my little poetry contest win, I dared to search for other writers. Over and over I saw SCBWI but no one bothered to explain the acronym. I finally landed on the SCBWI , Society of Children’s Book Writers and Illustrators, website. I read and learned and searched…I found and clicked a button that said conferences. It was so awesome…groups of writers for children all over the world! They met in London, Sydney, New York, Los Angeles, Terre Haute, Indiana….Yes, 2 hours away from my house, a group of like-minded writers was preparing to convene at Indiana State University. (Ironically, my oldest daughter is a student there now! It was fate! It was miraculous! IT WAS A SIGN FROM THE WRITING GODS! It was in 7 days! Oh blankity-blank! I got busy, booked myself a hotel, registered for the two day conference, and my husband rented me a red Mustang to drive, as he needed the minivan! Off I went on my first writing adventure, my first solo hotel stay…it was Aaawwwweeesome! I had full charge of the remote and the whole king sized bed. Bliss! I dressed like a writer. I wore a long skirt, heels, a cardigan sweater and a scarf..I was scared out of my mind, but I looked the part. I carried a shiny, new briefcase full of my typed stories that I was so proud of…they were my treasures and I was going to share them with the world! It was such a great weekend! I listened, learned and even shared a story at the open mike event. That Sunday, driving home, I knew this was in my future. Writing was in my veins. I was a writer. There have been ups and downs with my journey and now, 12 years later, I continue to attend SCBWI Conferences. I have met wonderful, inspiring authors, editors and agents. I’m at a different stage of my journey, but still learning. I leave in 2 days for a SCBWI conference near Nashville, TN. I’m as anxious today as I was that first time. I have ditched the heels and go for the more casual hippie artist/author look…comfort and layers are the key to a happy writing day. I’m looking forward to meeting and greeting and talking writing…and, I still get full charge of the remote and the whole king sized bed all to myself because…I’m a writer! BLISS! 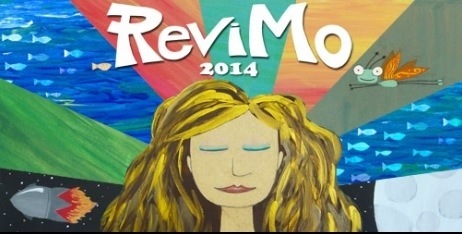 Check out this link for Revimo 2014 hosted by Meg Miller!